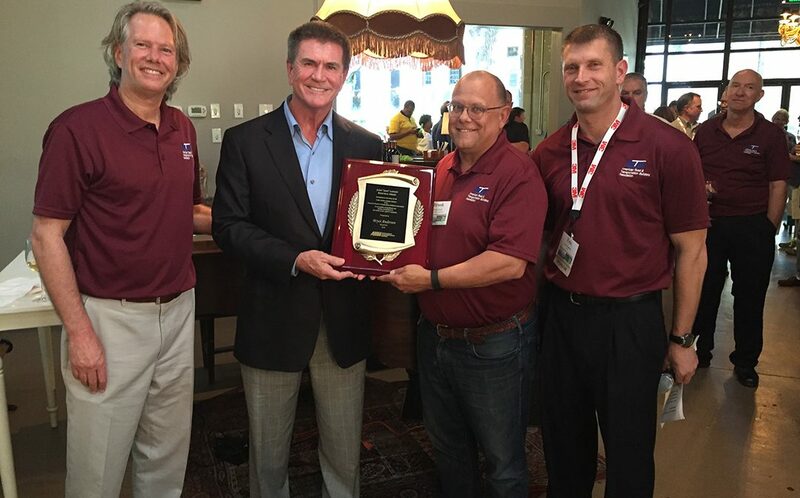 Pictured (from left): Kevin Groeneweg, Mobile Barriers, and president of ARTBA’s Traffic Safety Industry Division (TSID); Bryce Anderson, Ennis-Flint; Brook Jerzyk, Orafol, and TSID Awards Committee co-chairman; and Eric Hedman, 3M, and TSID Awards Committee co-chairman. ARTBA awarded its John “Jake” Landen Memorial Safety Award to King Gee (public sector), director of Engineering and Technical Services for the American Association of State Highway and Transportation Officials (AASHTO) and 35-year leader at the U.S. Federal Highway Administration; and Bryce Anderson (private sector), chairman of Ennis-Flint and an industry pioneer in pavement markings for 50 years. Established in 1989 in memory of Traffic Safety Industry Division (TSID) leader and past ARTBA Chairman (1976) J.C. Landen, this annual award recognizes outstanding contributions to highway safety. The awards were presented at the TSID summer social event in Savannah, Georgia.